When you work at home you need practical ideas for kids' entertainment, things for kids to do by themselves, particularly summer activities. Otherwise, they may end up getting too much screen time. 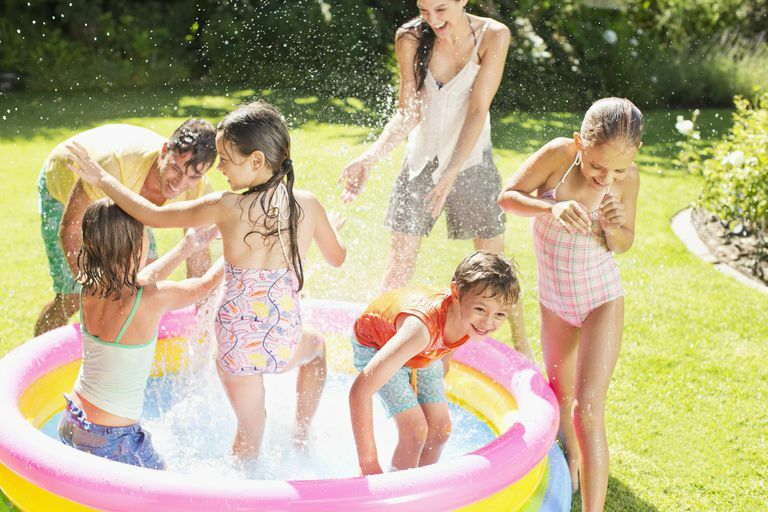 If you need ideas for every day, check out this series of things for kids to do every day—one activity for the weekdays of summer. However, parents, you know what they say about all work and no play, right? So don't let the kids have all the fun. Try out a least a few of these 100 ideas for kids and parents to do together. Bookmark this page and come back throughout the summer for inspiration. Pick your own...whatever. Find a farm with blueberries, strawberries, tomatoes, flowers, etc., and get picking. Cook out...frequently. Go beyond the burgers. Try veggies or fish. The kids might like them more if they come off the grill! Stargaze. Invite friends and make a party of it. Rearrange the furniture. Give the kid's graph paper and have them draw out a plan first. Take family naps together. Parents can snooze too! Make your own pizza. Try this kid-friendly recipe. Have a puzzle race. Use 100-piece puzzles and see who finishes first. Play a card game. Maybe crazy eights, spoons or poker. Take your pick. Make good use of nearby parks. Go to your local park's website, print the schedule of activities and tape it to the refrigerator. Start the back-to-school shopping early. The farther from the start of school the more fun kids think it is. Get the summer homework done. Not exactly fun, but you'll be happy to get it out of the way. Experiment with new hairdos. Let the kids try out not-permanent colors or braids. Or maybe a spiked look. Dig in the sand at the beach. Doesn't matter if it's in the ocean, lake or bay. Take an early morning bird walk. Let the kids cook dinner. In fact, make a tradition of it. Host the kids' friends for a sleepover. And then maybe your kids will be invited next—giving you a free evening. Go to a nearby museum that you've never been to before. Go to your favorite local museum...again. Make fresh lemonade. Maybe even sell it at a lemonade stand! Take a road trip to a nearby city. Spend the night if you can or just make it a day trip. Show the kids science is fun. Try these experiments. Watch family movies. Kids can't get enough of themselves on the big screen. Listen to a classic as an audiobook. Or try these newer audiobooks. Teach the kids a game you haven't played since you were a kid. Make ice cream. We use this recipe with great success. Use bikes as a mode of transit. Show the kids the way to the store or a friend's. Go fishing. In many states, kids can drop a line in without a license. Paddle a kayak or a canoe. Or if you're really adventurous try white water rafting. Jump rope. Chant these jump rope rhymes. Press summer flowers. Make a pressed flower picture. String beads. Beading for kids can be as simple or complex as you choose. Blow bubbles. Make your own! Find a new place to play. Easy idea: Clear out the basement or garage. Complicated idea: Build a tree house. Teach the grandparents to use Skype. And show off your new skill. Make fairy houses. Use moss, bark, and leaves in a dwelling fit for Thumbelina. Build your brain. These brainteaser games can help. Run in the yard. Kickball, wiffleball, Frisbee, and the tag will keep you moving. Join a summer reading club. Parents can list all their books read over the summer too, but I doubt you'll get a prize. Make photo gifts online. Grandma will love them. Create a treasure hunt for kids. Do it on your own property or around town. Join a Junior Ranger program. Both national parks and many state parks have them. See a dramatic performance together. Doesn't matter if it's a puppet show in the park or a touring Broadway show. Play charades. Turn all that drama into a game. Get a book of riddles. See if you can stump each other, then write your own. Keep your kitchen cool. Make no-bake cookies.